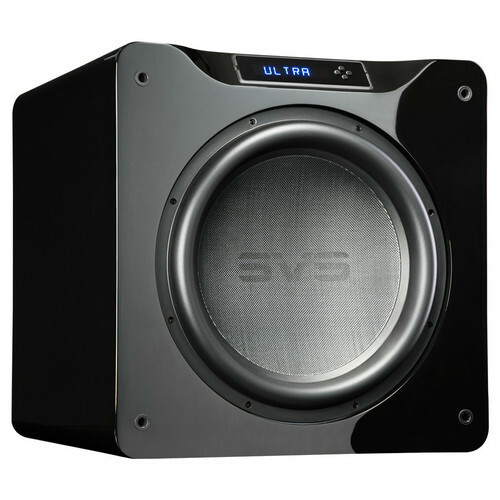 Add powerful bass to nearly any home or professional installation with the piano gloss black SVS SB16-Ultra 16" 1500W Subwoofer. It features a 16" front-firing woofer with 1500W of RMS power and 5000W of peak power for ground-shaking performance nearly anywhere. With a frequency response of 16 to 460 Hz, the SB16-Ultra is equipped to handle virtually all types of listening material. It can be controlled wirelessly via the included IR remote, the front-panel display, or an iOS- and Android-compatible smartphone app via Bluetooth. Compatible with Apple and Android platforms, the SB16-Ultra smartphone app controls all DSP functions and stores custom presets. For added convenience, 2-way feedback shows updates in real time on both the app and subwoofer interface, and Bluetooth connectivity allows adjustments to be made even when the subwoofer is not in sight. Control is also available via the included IR remote and a front-panel display. The SB16-Ultra is built with a double-thick MDF front baffle and internal bracing to support the drive unit and to help ensure an acoustically inert environment. The reinforced internal design helps eliminate coloration or resonance from the cabinet, even when the deepest low frequencies are played at reference sound pressure levels. Box Dimensions (LxWxH) 31.7 x 26.0 x 25.6"
Is it 220 volts ? It is dual voltage. It requires 100 to 240 VAC, 50/60 Hz, SVS confirmed.